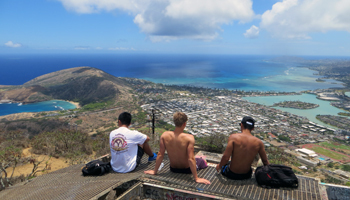 Hike Koko Crater for a Hard-Earned View from the Volcano Top. 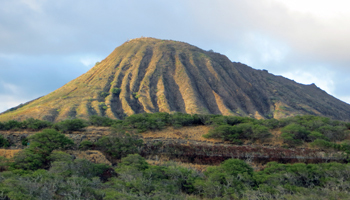 Koko Crater: Tallest Volcano on Oahu's South Shore! What many people refer to as Koko Head Crater is actually the Koko Crater or Kohelepelepe (we’ll stick to the former name to keep things simple). Yes, they have similar names, but they’re not the one in the same hike. Koko Head Crater is the smaller of the two volcanoes, and it has three separate crater depressions – the largest of which is Hanauma Bay. That’s not the hike I’m describing here. Koko Crater, on the other hand, is twice as tall as Koko Head, and it’s much more iconic. I mention this because it’s likely to be confusing when I tell you to park your car at Koko Head District Park and then walk to what Google Maps shows as the Koko Head Trailhead. Yeah… well at least you don’t have to say Kohelepelepe five times fast. 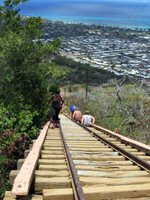 I’m ashamed to say that whereas 22-year-old me used to take Hawaii hikes like this practically at a run, 20 years and an extra 40-ish pounds made it necessary for 42-year-old me to rest frequently throughout the hike to the top of Koko crater. The hike itself is only 0.4 miles long (one way from the parking lot; not from the base of the trail), but in that short distance, it climbs 1,208 feet in a straight line up the side of the crater. 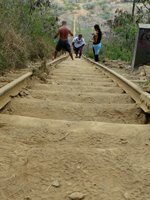 The railway ties are farther apart than stairs, and the slope is steeper - starting at approximately 35 degrees angle of ascent and increasing to about 50 degrees! As a result, this exhausted my leg muscles much more quickly than if I could have taken smaller steps. After approximately the first 250 steps, I found myself needing to rest every 40 or 50 steps. I would feel terribly embarrassed about my pathetic state of fitness, except that three-fourths of the other hikers were moving at the same pace. 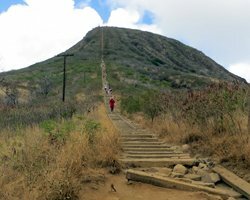 Nevertheless, I saw several dozen hikers ranging in age from approximately 10 to 60 – plus two dogs; so Koko Crater isn’t exclusively for elite cross-trainers. The trail is fairly narrow, and there are no railings. For approximately half of the hike, this isn’t much of an issue; but on the steepest portions – and on the bridge (approximately 10 feet above a narrow ravine) – it’s a little nerve-wracking. I saw several people go down on all fours to cross this section. Make sure you bring water and liberally apply the sunscreen, because it is very dry and can get very hot. There’s no sense adding sunburn and dehydration to your muscle pain. Also, keep in mind that this is not a peaceful stroll through nature. It’s right next to the shooting range. Thus, when I went on a Saturday in July, the gunfire was loud and incessant! You can say you did it. 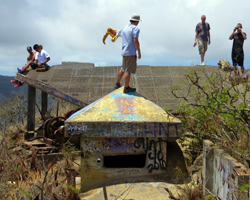 Not everybody gets to climb to the top of a dormant volcano. There’s a world-class view. You can see into Diamond Head Crater, into Koko Head Crater/Hanauma Bay, into the Koko Crater Botanical Garden, Sandy Beach, a significant portion of Oahu’s South Shore coastline, part of downtown Honolulu, all of Hawaii Kai valley with its lagoons – and on a clear day, you can see the islands of Molokai, Lanai and Maui. Discover a piece of World War II history at the top. It’s free, and the parking is free. Disclaimer: Stupidity and carelessness can kill you. Use your brain and take responsibility for your own safety. Know the limits of your ability and stay within them. Watch your kids like a hawk. Heed posted warning signs. Stay on the marked trails. Bring lots of water and snacks. Use your sunscreen. Live to enjoy another Hawaii vacation day!